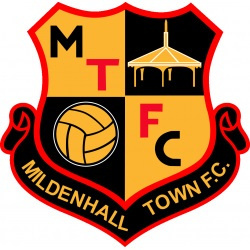 Mildenhall Town manager Ricky Cornish has confirmed the loan signing of Cambridge United Under 18's striker Sam Bennett. The striker arrives for a month initially, and will be available for Town's trip to fourth place Maldon & Tiptree on Saturday. Bennett and his U's side play in the EFL Youth Alliance South East Division, and the striker managed hat tricks against Luton Town and MK Dons. You can watch him score one of his goals against MK Dons here.